Energy use in the summer is reduced by 42% over code. Ground source heat pumps used for cooling. Occupant water use is reduced by 43%. Embracing principles of sustainability from the project’s inception, the 46 Blackstone Street complex is the most ambitious green building project Harvard has ever undertaken. The client, University Operations Services (UOS), set sustainability goals early in the process by including sustainability language in the Request for Proposals to the designers. This ensured that sustainability was a primary focus at every stage of the design and construction process. The project team's dedication to sustainability was recognized in April 2007, when the building was awarded a LEED Platinum rating. This is the highest level possible in the USGBC LEED system, and is Harvard's first LEED Platinum building. 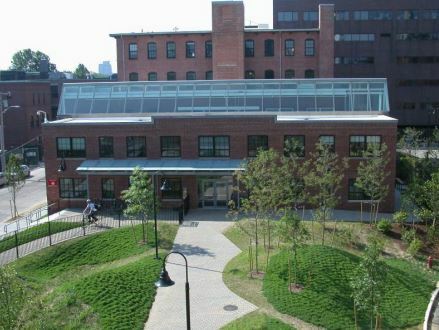 The 45,000 square foot renovation, completed in May 2006, is the new home of several formerly decentralized UOS departments and will serve as an example of Harvard’s commitment to environmentally responsible building for years to come.